Was ready for work pretty early this morning so decided to go into Superstore before it got crazy. Was looking for the $1 Dove deodorant and cheap Glade products to use up my coupons that expire tomorrow. The Glade wasn’t as cheap as I would of hoped but I picked it up anyway. Also scored some L’Oreal Collagen Remodeler (day) for $2.99, wish there had of been more than one for that price. And some cute Christmas tags for 75% off. 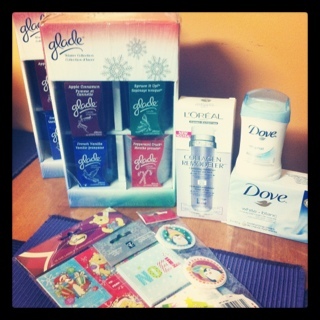 This entry was posted in canadian coupons, coupons, free, scop, superstore and tagged canadian coupons, coupons, free, scop, superstore on December 30, 2011 by Courtnie.